When I left off with my telling of the story of this quilt I had an approved sketch. I had a month to complete the quilt and ship it so it would arrive in time for the Diamond wedding. I felt the importance and relevance of this project all the way through the process. The concept behind the quilt was to portray their journey and it was truly a journey for me as well. 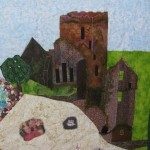 I researched Kathryn’s roots and found photos of a castle in Ireland in the town from which her family came. The castle is in ruins today, but you can still envision its former glory. The area around the castle is of course a rich green — would you expect anything else in Ireland? I found loads of photos of the skyline of New York, but I decided to only loosely base the NY portion on the real architecture. I tried to approximate the Empire State building, the Chrysler building and the Citicorp building. I did a lot of hand sewing to depict the intricate detail of each building. 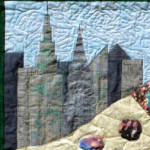 As a former New Yorker, I worked on the NY skyline with much fondness. Below are photos of the two background areas, which show where Neil and Kathryn came from. Next entry I will talk about the individual paths they took till they were joined together in marriage. Hope you are enjoying this story as much as I did! Speak to you soon!